With Dean out again today, a city centre start moving back towards the mooring later on is the plan. The boat is loaded by 7am and we set off upstream towards the city in blustery winds. As predicted the wind soon dies out and we moor up near the Turning basin and set up about 8am. I set up one live and one dead bait rod, while Dean chooses Two live baits. Despite moving the baits around and even having a look on a lure rod, no takes were forthcoming. We do our usual move downstream to the Football ground bank but still cant get a bite on anything. I cook the Bacon rolls and once eaten, we head back to the "outfall" area on the Yare. We are soon moved and set up in the new swim, Twenty minutes later Dean gets a run on a Roach live bait but misses it, coming back with no bait. 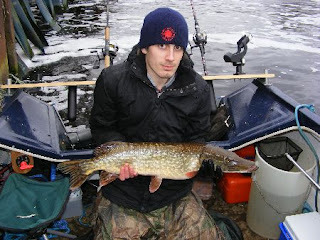 He does not wait long for another chance and this time a hard fighting 8lb 13oz fish is boated. 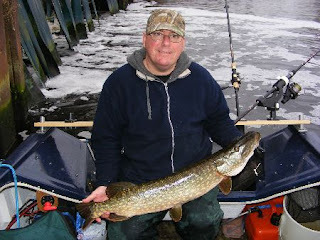 I finally get in on the action an hour later when my dead "Bluey" is picked up from very close to the boat. Another decent scrap has a 10lb 9oz long thin fish in the net. Im quite surprised it goes 10lb 9oz as its so thin. Deans 8lb 13oz fish with a nice fat belly looked like it should have weighed more. As 2:30pm arrives we pack away the rods and head back to the mooring. Just as we are unloading the gear into the car, the wind starts picking up again and the rain starts quite heavily. I cant believe we got away with the weather all day again.